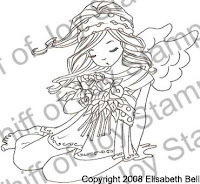 Only 2 more hours until the new Guardian Angel stamps designed by Elisabeth Bell will be available in the Whiff of Joy online store. I wanted to take this chance to show you all new stamps in one place. Nur mehr 2 Stunden bis die neuen Schutzengel Stempel designed von Elisabeth Bell im Whiff of Joy online store erhältlich sein werden. Da wollte ich meine Chance nutzen und euch alle neuen Motive hier bei mir zeigen. And here comes the chance to win a whole set of these fabulous new stamps. Just leave me one of your lovely comments under this post and I will pick a random winner tomorrow at 9 pm my time (see the clock in my sidebar). Und hier kommt eure Chance ein komplettes Set dieser tollen neuen Stempel zu gewinnen. Hinterlaßt mir einfach einen Kommentar unter diesem Beitrag. Ich werde morgen um 21:00 einen zufälligen Gewinner nennen. Wanna get some inspiration for the new stamps? Visit the Whiff of Joy Inspirationsgallery. Wollt ihr euch vorab schon etwas Inspiration für die neuen Stempel holen? Dann schaut doch in der Whiff of Joy Inspiratinsgalerie vorbei. How exciting they are ALL so cute! Oh I love everyone of them - they are adorable just like the ones before them!! Thanks for a chance to win! They are absolutely adorable, will have to put them on my wish list and hope to get some soon. Great blog. I need each and every one!!! All the new stamps are just gorgeous Katharina!! I think I love Musing Melinda & Confirmand Melinda best. Oh and the Cute Snail and the Cat are so adorable, love those too!! They are all just lovely, I LOVE Whiff of Joy stamps!! This is sooo great, I just have to try :) Love your new images, can't wait till tomorrow. Have the whole night to decide which I need right away. Hi Katharina, I have been trying to find this kit to buy in your on line shop but I couldn't find it yesterday and I can't find it today. Can anyone tell me exactly where to find this please? i love all of them. Wow, die sind einfach alle so traumhaft schön! Auch die Zubehör-Stempel sind klasse! Und danke für deine Großzügigkeit, dass du uns wieder die Chance gibst etwas zu gewinnen! super Blog und das Candy erst! OOOH, Pick Me, Pick Me!!! :) I love them ALL thanks for the chance to win! WOW, die Stempel sind allesamt megaschööön!!! Yes please enter me, they are all so cute and all so necessary. Wish I had that Confirmand one, will definitely have to order boy and girl asap. wie ich ja schon geschrieben habe finde ich die Stempel wieder traumhaft schön. Vielen Dank das Du uns wieder die Chance auf einen tollen Gewinn gibst. Nun versuche ich auch mal mein Glück. This new release is just fantastic. Love all the angels, Confirmand Melinda is just darling. And who doesn´t like cats?! Thanks for the chance. Hi Katharina! Thanks for a chance to win the stamps! They are all beautiful, I think I like musing Melinda and Confirmand Melinda best. :) I thought it was going to be a blog candy with a challenge or some other catch and I was prepared.lol My WoJ whishlist is getting bigger with the new stamps. :) I think it's time to get some again. das sind ja wieder supersüße Motive - das süße Schneckchen hat es mir besonders angetan :-))). Hi Cazzy, no wonder you coulnd't find them in our shop. The will be released in about 1,5 hours so you only have to wait a little longer. they are wobderful and I love them all!!! I would like to win them. thank you for the chance. Thanks for the pics of the new stamps - they all look lovely! I love Melinda so I would love to win her. Thanks so much for offering the blog candy! Gorgeous gorgeous stamps - please enter me in the draw. Oh they're so wonderful, each one! would love to give these a good home. thanks for the chance. Oh wow, they are all fabulous Katharina, I will hope I am still awake at midnight to order mine! What a wonderfull candy. I just love this Melinda stamps. Very cute - Mädchen mit Blumenstrauss finde ich am schönsten. And the bench. Bis jetzt habe ich noch keinen solcher Stempel. Thanks for the chance to win one. die neuen motive sind echt toll!! They are all so cute! I am already planning the first cards I'll create with them *lol*. These are so cute. I am new to your blog, but I am now a subscriber and a follower. You are very creative. I found you through http://iheart2stamp.com/ Thanks for the chance to win these great stamps. vielen dank für das mega candy, ich finde alle motive sind wieder ganz ganz zauberhaft!!! ich wünsche einen schönen sonntag!! Wunderwunderwunderschön..., die neuen Stempel sind einfach traumhaft!!! Hammer... die neuen Stempel sind soetwas von toll! Einfach wunderschön! Wow Wow more delightful stamps, what a great collection i love them all. Goodness, they are all great! I think that bench would also go so well with the Spring Kit! Can't wait to get it! Thanks for giving us a chance to win them! oh mein gott,die sind ja zuckersüss.ichdiehabenwillbittebittebitte. es ist der wahnsinn was für tolle stempel du immer wieder machst. These new WOJ stamps are beautiful, thank you for being so generous. The stamps look really good!!! wieder mal super süße neue Stempelchen,mein Favorit ist Confirmand Melinda. Hope I had a little luck. What fabby images Katharina. I feel a spending spree coming on! Ein herzliches danke schön!!! Erstens für die schönen stempel die man gewinnen kann. Und Zweitens wenn man nicht gewinnt hat man die chance sie zu kaufen. Verlieren kann man also nicht. Alle stempel sind wieder traumhaft. Katharina, the new stamps are gorgeous!!! Thank you for the opportunity to win! These are all gorgeous! 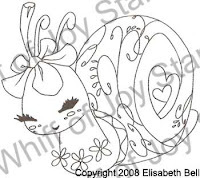 I especially love the cute little snail...and those swirls are fab! Thanks for the chance to win this fantastic candy! These new releases are just devine. well I adore them all. Thanks for the chance to win them. They are all super fabulous Katharina!! Love the snail for sure and Musing Melinda I think would be my fav, but love them all!! This new line is so beautiful!! I can't wait to order mine!! I'm so excited about the blog candy too. Thanks for offering it to us. Thanks also for the continued wonderful stamps that you offer us. Wow these are all so gorgeous. Would love to get my hands on these but no money for stamps just now so will have to keep my fingers crossed to win some!! Thanks so much for the chance to win. I love new Melindas .This candy is really great. my goodness, that's fantastically generous. 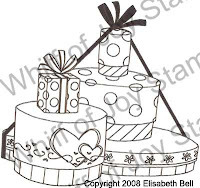 I just love Elisabeth Bell's designs. I am a BIG fan of your stamps! And these are (again) so cute! Love them! I adore these new stamps and can't wait to get some. I've only recently started collecting stamps WOJ but am the proud owner of some from the Spring 2009 collection. 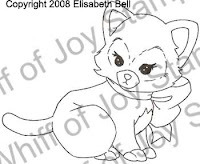 I love, love, love Elisabeth Bell's designs!! Wow Katharina, so generous of you. These are just stunning, I love the cute snail and the cloud swirl is fantastic. Well done on a nother great bunch of stamps. Would love to win the set, a privelege to own! die Engelchen sind alle so goldig und die wunderschoenen Extras. I love them all,and I love the swirls and sentiments. You always make such beautiful sentiments! I'll be staying up late tonight ready to start shopping! Thanks for the chance to enter. Hallo Katharina, also wenn mein Schutzengel meinem Glücksengel noch schnell bescheid sagt, dann bin ich vielleicht die glückliche, die dieses Set gewinnen wird....! Die Stempel sind alle zuckersüß und müssen einfach in meine Sammlung aufgenommen werden! These all look just too adorable! I can't wait to use them, I know how much I have loved my other Whiff of Joy stamps and these will only be icing on the cake when it comes to the collection. Love them! Wunderbar! Ein tolles Candy und phantastische Stempel! Oh das sind ja tolle neue Stempel, da werde ich gleich mal im Shop vorbei schauen es ist ja schon nach 0:00 Uhr. These are simply divine! I love them all. They are all adorable. My favorite though is Melinda with Bouquet. She's so beautiful! Oh Katharina, these are gorgeous!! I've been enjoying the sneak peeks all week!! Looking forward to tomorrow! wooo die Stempel sehen ja super süüss aus .da werd ich doch mal mein glück versuchen . Sind das wieder mal klasse Stempel! Total goldig. These are some great stamps. I'd love to win, but they will have to go on my wish list if I don't. Keep those wonderful ideas coming! Die Stempel sind ja echt klasse, Katharina!! Das Design wird jedesmal besser, und die "Zubehoerstempel" sind auch eine prima Idee. Ohhh they are sweet, I love the angels. Well them and all your other stamps.lol. These are all so cute, my favs are Melinds with bouquet and the little cat. Thanks for the chamce to win. It's very generous of you to give us all a chance to win a complete set! The confirmation bot is just what I need for my godsonwho will be making his First Holy Communion in May. How timely this stamp is! I also love the snail and the cat! Congratulations on another awesome release. 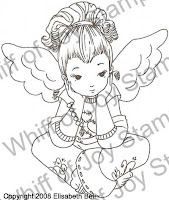 WIW what fab new stamps, i would love to give them a home.Thanx for such fab candy. I think my favouites this time must be the cat and the snail...but all of them were beautifull!!! Wow...that is just awesome...never wanted to win blog candy so much as I do this candy. Thanks for the chance. What beautiful Stamps. Thanks for the Chance to win.. You ROCK!!! these are really cute stamps! thanks for the nice blog candy! Die neue Kollektion ist wirklich wieder sehr niedlich geworden! Ich musste gleich zwei Motive kaufen, aber die Entscheidung welche, war schwierig zu treffen. My favorite is Melinda with bouquet sitting down.But their all cute. Thanks for the chance to win. oooo, what a fabulous chance to win! thank you!!!! OHHHH MY GOODNESS - Every single one is just wonderful. I want them ALL... You know me Katharina, I can't help but be a little spoiled. I really WILL have them all at some point. Wow, was for tolle Stempelchens! Die sind alle sooo knuffig. Lieben Dank für die Chance zu Gewinnen. Love your stamps, Katarina. Your service is above and beyond routine! Thanks so much for the opportunity to win this fantastic prize! WOW. These are gorgeous Katharina. Katharina, thank you for the opportunity to win these sweet stamps. Oh how I'd love to own some. Maybe, just maybe......i can hope!! Not sure if this is closed or not but these stamps are adorable!! Love all your new stamps - hope they'll be coming to my house to live. Thx for the opportunity to win. What an amazing chance! Thank you for this FANTASTIC chance to win! All if these stamps are amazing, and a chance to win them ALL!!! They are all so adorable!!! Thanks for the chance to win such great candy! Adorable new release! Thanks for the opportunity to win these jewels! I am super excited about the new releases. They are ALL so fabulous. Gorgeous as usual. Another bunch of winning stamps. Thanks for the chance to win that is very generous of you. It would be too much to think I could win these beautiful stamps, but you never know!! Good luck everyone! These are all so beautiful! Though Melinda with muffin basket touches my heart the most! Thank you for your generousity! They are amazing! !You did it again Katharina,you know me a little and you know how I love the other ones,and these once are again really beautiful! !Of course I hope that I win so I can make my collection even more adorable as it already is.I hope you understand me again?! Oh Katharina what fabulous stamps! I think all of my hubby's money comes directly your way! ha ha! I am in love with all of the newbies in the angel collection! 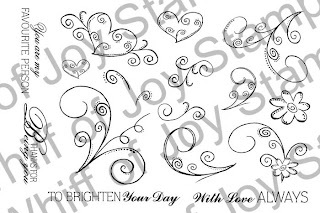 CONGRATS to Sonja for designing the swirl stamps...they are so lovely! Thank you so very much for the chance to win...I would love to have them all! Hope you are having a fabulous weekend! They are all so fabulous, I wouldn't be able yp choose! Thank you for the chance to own them all! They are all so beautiful. What great stamps, and I am so thrilled to have the chance to win them. Thank you so much. WOW they are sooo gorgeous!! These are all such beautiful images, thanks for a chance of winning them. I cant wait til I can order if I dont win! I Scrap So All Moments Are Remembered!! Those stamps are soooooo cute!!! Ooh! These are wonderful! I love the accessories - that bench will be very versatile! Thanks for the chance to win! I am new to Whiff of Joy stamps and have just a few. These new stamps are soooo cute, I want them all. Thanks for the chance to win. These are adorable! I have fallen in love with this stamp line! I love all the new images, but that snail takes the cake! The new stamps are just beautiful! Thanks for the chance to win them all. Ich versuche auch mein Glück und hoffe die süßen Dingelchen zu gewinnen.lach. Was für eine schöne neue Kollektion. Werde mal gleich stöbern gehen. Die neuen Stempelchen sind wieder superschön! Gefallen mir alles sehr gut! Die neuen Motive sind wieder echt süss, gefallen mir gut. Hallo Katharina, ich finde die neuen Stempel auch wunderschön und versuche so auch mal mein Glück. I love muffins -))) They all will be on my wishlist. Hi Katharina, die neuen Stempel sind wieder alle ganz bezaubernd. Beim Candy versuche ich natürlich mein Glück. schöne Stempel habt ihr wieder gestaltet. OMG I love all the new stamps. WoJ is one of my absolute favourits. Everyone of these stamps are Fabulous! Thanks for giving us a chance to win them! OH MY.......what a fantastic set of stamps. I have enjoyed looking at the Designs Teams work with these stamps. Teasing us all. It has been Wonderful. Wonderful Candy, thanks for the opportunity, it's is so kind of you. WOW-these are just gorgeous and what an opportunity to maybe win them ALL- how exciting. Thank you so much for this chance. I really adore the snail- something which is so slimy and not too pleasant in real life has been turned into this adorable creature- well done. They are all lovely, so hard to make a choice of which ones to order. Thanks for the chance of winning, can't wait for the draw!! Die sind ja durch die Reihe allesamt einfach nur schön! Ganz besonders toll finde ich auf die Schnörkel von Sonja....einfach toll! ohh that will be a hard choice for me, which ones I really really want to have :) I would love to have them all but the snail is definitly coming to live with me :)it is sooo cute! They are all gorgeous again! My absolute favourite is the little kitty, so cute!! Thank you for the chance to win! Wunderschoene Stempel wie immer! Mein Lieblingsmotiv bei den Bildern ist "Musing Melinda", aber ich hab mich auch in die Schnoerkel und Texte verliebt! Meine Daumen sind gedrueckt, dass ich vielleicht mal Glueck habe und was gewinne! Oooh... these stamps are so beautiful!!! Thanks for the chance to win this great candy!! Someone, somewhere will be very happy with it...I can only dream it's me! A new fantastic release. You and your team are great designers. vielen lieben Dank, dass wir die Chance haben, die süßen Stempelgummis zu gewinnen!! Gorgeous stamps! Looking forward to receiving my two new Melindas and the wooden bench - so nice! What a lovely stamps, I love them. Thanks for a chance to win such a lovely candy. Wow, Katharina! Thanks so much for the chance to win these adorable stamps. I love them all, but I think my faves are Musing Melinda, Cute Snail and Spring Swirls. Love the stamps - they are all so gorgeous. Thanks for the chance to win. Ohhh,Katharina, the stamps are great again. Oh, das sind aber süße Motive. Da werde ich doch gleich mal in Deinen Shop düsen, denn das Glück steht mir bei Blogcandys meistens nicht bei. Die neuen Stempel sind wunderschön, und die Schnörkel von Sonja sind auch klasse!!! They are so beautifull! Thank you for giving them up to us! wow this is really great to offer to someone I hope it will be me! Waw, what a great release. Love them :) Thanks for a chance to win! ohh katharina, sind die wieder schöööön!!! besonders das kleine kätzchen hat es mir angetan. schade eigentlich, dass es diese serie nicht auch als pre-order-kit gab, hätt ich auch wieder bestellt. na mal gucken, vielleicht hab ich ja glück, ansonsten werd ich nächste woche mal den shop stürmen. ohh boy.. I want them all.. how can I ever choose?? they are alle adorable.. but I espescially love the kitten..
Halo Katharina, die neuen Stempel sind alle ganz bezaubernd. Beim Candy versuche ich natürlich mein Glück. Oh my god will have to definately have some of these in my collection. They just get more adorable each time new stamps are released. Lieben Dank, dass ihr auf meinem Blog vorbei geschaut habt und euch die Zeit nehmt mir einen Kommentar zu hinterlassen. Ich weiss wie kostbar "Zeit" ist, deswegen weiss ich jede einzelne Nachricht sehr zu schätzen. Ich bemühe mich sehr, euch einen Gegenbesuch abzustatten, auf eure Fragen (direkt hier in den Kommentaren) zu antworten und bin auch via Email gerne für euch da. Wie ihr ja alle wisst, spielt es im Leben nicht immer so wie man es plant. Und mit 2 Kindern, Haushalt und Beruf kommt schon manchmal etwas dazwischen. Thank you so much for visiting my blog and for taking the time to leave me a comment. I know best how valuable "time" is, therefore I appreciate your comments immensely. I try my best to visit your blogs, to answer your questions right here in the comment section or via email. But you all know how stressful life can be, with two children, household and work. Sometimes, life doesn't go as planned. Riesenflohmarkt bei Mausi - Hallo zusammen Schaut mal bei Mausi´s Bastelwerkstatt vorbei, Sie verkauft jede Menge SU Stempelsets.